It was my fourth Gold Medal Plates Toronto as wine judge, culinary taster and olympic athlete groupie. In 2014 WineAlign partner, colleague, mentor and friend David Lawrason invited me to join the festivities and help decide which three wines should be crowned Gold, Silver and Bronze. Two weeks ago a panel of Ontario wine experts tasted, assessed, debated, deliberated and ultimately decided this year’s top three. David Lawrason, John Szabo M.S., Michael Vaughan, Margaret Swaine and Godello. The winner ran away from the pack but two through six were separated by one point increments. It was a photo finish for Silver and Bronze. The 2017 Toronto event featured emcee Scott Russell of the CBC’s Olympic coverage. Russell was joined by dozens of Olympic medallists and future hopefuls. Blue Rodeo’s Jim Cuddy led the on-stage entertainment; Anne Lindsay, Danny Michel, Jeremy Fisher, Devin Cuddy and Sam Polley. The inimitable and eloquent James Chatto was once again at the head and the heart of the culinary judging panel with seats occupied by an illustrious five; Sasha Chapman, Anita Stewart, Christine Cushing, Amy Rosen and Chef John Higgins. For a little bit of GMP history please click on this post I penned after that 2014 gala event. The culinary winners then were Gold Medal Plates Toronto 2014 bronze, gold and silver medal winning chefs Damon Campbell, John Horne and Jason Bangerter. The top three wines were Norman Hardie‘s Niagara Unfiltered Pinot Noir 2011, Hidden Bench Nuit Blanche Rosomel Vineyard 2012 and Creekside Estate‘s Iconoclast Syrah 2012. But what about 2017? My top seven in no particular order were Flat Rock Cellars Riesling Nadja’s Vineyard 2016, Ravine Vineyard Chardonnay Reserve 2014, Charles Baker Riesling B-Side 2016, Henry of Pelham Cuvée Catherine Brut Rosé, Stratus White 2013, Leaning Post Chardonnay ‘The Fifty’ 2015 and Tawse Chardonnay Quarry Road 2013. The actual medalists are listed below in David’s report. 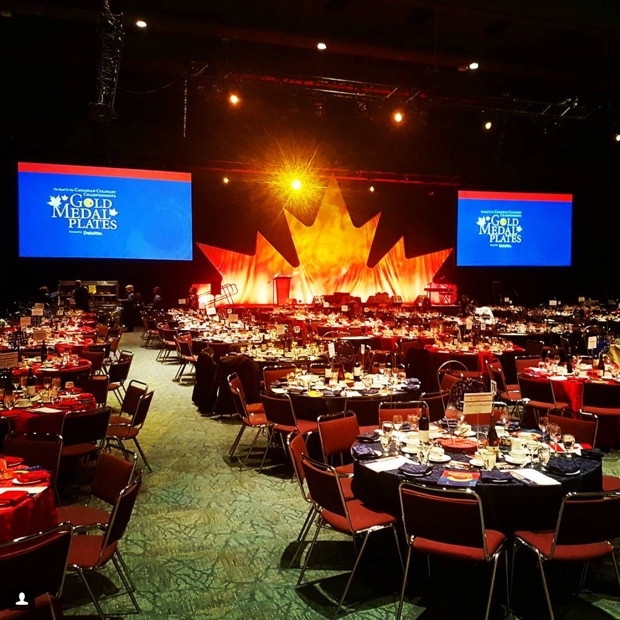 “The Gold Medal Plates campaign came to a booming 800-person conclusion at Toronto Convention Centre on November 16, and it included the largest selection of wines seen in any stop on the ten-city national tour. We judged 26 donated wines, beers, spirits and even a lavender mead, but it was a core of great Canadian white wines that caused the most excitement, and produced the winner of the evening. The “Best of Show” Gold Medal went, by a very clear margin, to Flat Rock Cellars 2016 Nadja’s Riesling, from a single block of maturing vines in Niagara’s Twenty Mile Bench appellation. I was personally stunned by just how delicious, well-balanced and nuanced this wine is – in my mind it is the best vintage of “Nadja’s” ever produced. Other judges agreed – we all placed it as either our first or second choice. This beauty also took a rare Platinum Medal at 2017 National Wine Awards. It will go on to compete for Gold Medal Plates Wine of the Year at the Canadian Culinary Championships in Kelowna in February, and it appears there will be a riesling showdown, as it will be tasted against rieslings from Tantalus, Cave Spring and Norman Hardie, plus six other wines. For second and third place the voting in Toronto was more varied, and only one point separated the second, third and fourth place wines. The Silver Medal went to Mission Hill 2015 Merlot Reserve, a swarthy, plummy and ripe red from the Okanagan Valley. And the bronze medal went to Henry of Pelham Cuvee Catharine Brut Rose, a delicate refined pink sparkler with subtle berry aromas. In very close 4th place came Tawse 2013 Quarry Road Chardonnay from Niagara’s Vinemount Ridge sub-appellation. I have become very familiar with this solid, complex Burgundian chardonnay as it was generously donated by Tawse to the Celebration in three cities this year. It was also a Platinum Award winner at the 2107 WineAlign National Wine Awards of Canada. Tawse was one of three Gold Level sponsors. Mission Hill was a national sponsor as well, donating a variety Reserve wines to seven city events across the country, and stepping even higher in Toronto with smaller donations of their more expensive “Legacy tier” red Compendium 2013 and Perpetua 2015 Chardonnay. Arterra Wines, the recently re-named company with several wineries in Canada, was a gold sponsor donating to six cities. 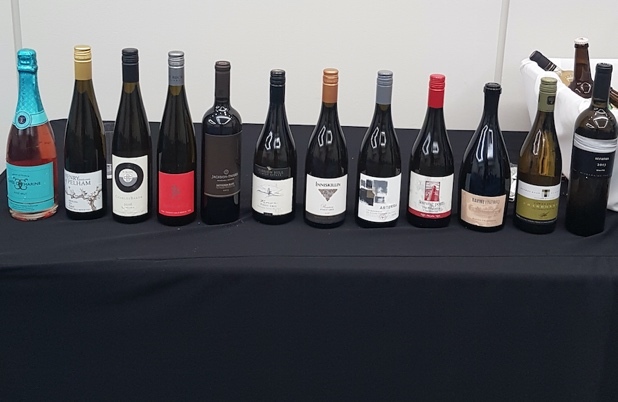 In Toronto there was a selection of reserve whites and reds from Jackson-Triggs and Inniskillin, as well as a rare public showing of the new Arterra 2016 Chardonnay and Arterra 2016 Pinot Noir. Toronto’s Silver Sponsor also donated to Ottawa. Cave Spring of Niagara donated their 2015 Cabernet Franc. Although better known as a riesling producer, Cave Spring is doubling down on its efforts to produce fine reds from Ontario’s most widely grown grape. 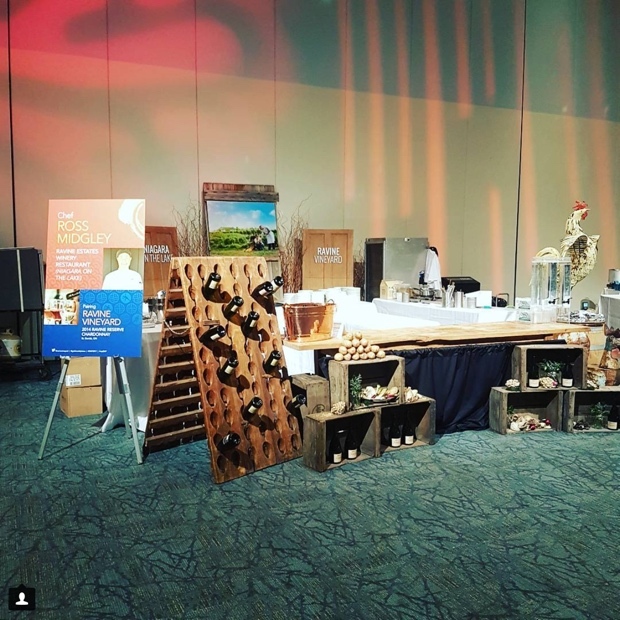 Flat Rock Cellars was one two Bronze level sponsors for the Toronto event, providing Nadja’s riesling for the VIP Reception and Celebration tables. The other was Henry of Pelham, which split their donation between the 2016 Old Vines Baco Noir and yet another strong 2016 Estate Riesling. Among other notable and high calibre wines donated to the chefs, I gave my first-place vote to Stratus 2013 White, a very complex, now maturing, barrel aged blend of several white varieties. Ravine 2014 Chardonnay Reserve, another power white, also earned top-five votes. 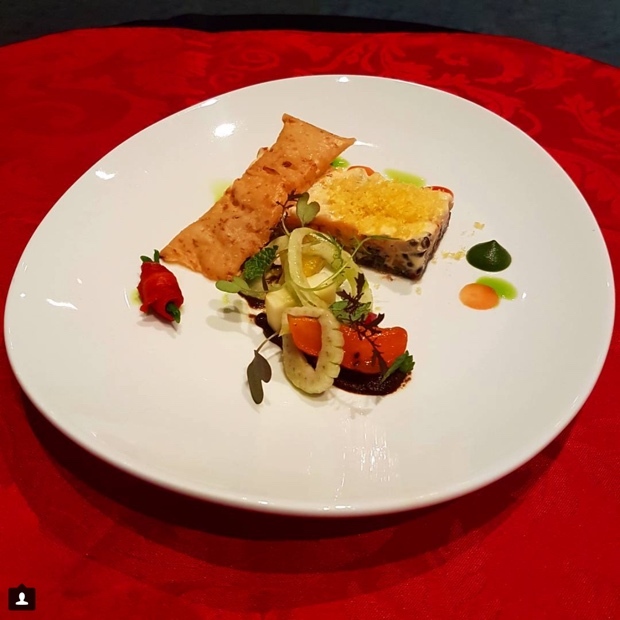 Leaning Post 2015 Mile 50 Chardonnay was a leaner style that paired well with Gold Medal Plates Chef Lorenzo Loseto’s winning dish. And riesling specialist Charles Baker chose the occasion to show his new, bracing B-Side Riesling. 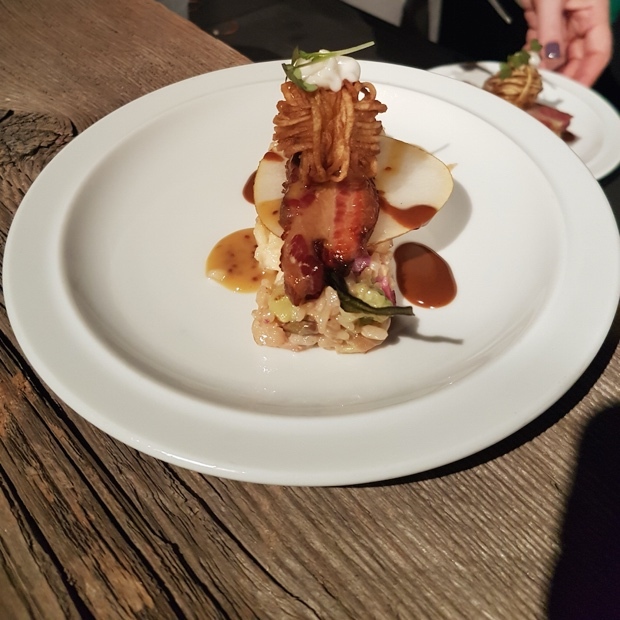 Interestingly, no red wines were paired with chef’s creations this year, but there were two ciders, including the fine, crisp Brickworks CiderHouse Batch 1904 and a lighter cider called Pick Up 66 from Hoity Toity Cellars. Rosewood Cellars donated their exotic, fragrant Lavellener Lavender Mead, and Zirkova Vodka set up shop during the VIP Reception to sample Zirkova One, a vodka designed to be drunk “neat” and Together a version designed for cocktails. 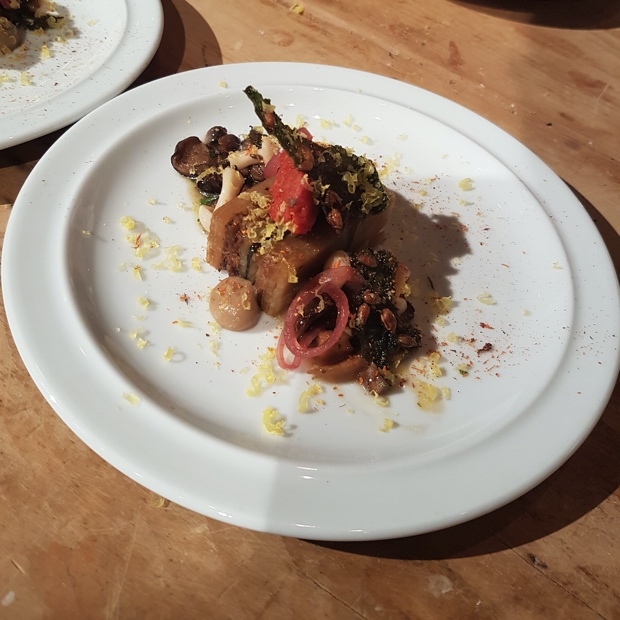 Chef Lorenzo Loseto’s @GoldMedalPlates winning dish @georgeonqueen paired by @brieish with @leaningpostwine The Fifty Chardonnay 2015. Congratulations Chef and the entire team. Here are my tasting notes for the 20 wines entered at Gold Medal Plates 2017. A wine sign of the apocalypse? Every once in while events come along in a confluence of conspicuous timing that just seem to indicate “a sign of the apocalypse.” Today is both the first day of the Jewish holiday, Hanukkah, the Festival of Lights. It’s also American Thanksgiving. The next time the twain (and the Maccabees) are scheduled to collide is in 79,811. By that time they will be making Barossa-style Shiraz in Vostok Station. Thanksgivukkah? Please say it ain’t so. Meanwhile, it’s the 28th of November and most of Canada has already experienced three straight days of true winter. While the winter of 2012 may have seen plenty of white stuff, who doesn’t remember the Spring conditions of November through March of 2011? Yesterday my neighbour pined for a return of global warming. Now my thoughts turn to the Canadian wine harvest. Every Ontario grower has finished picking their grapes, with only Icewine left to go. Every grower? Even J-L Groux and team from Stratus Vineyards are done. In 2009 J-L picked Cabernet Franc on December 8th. What? Cabernet Sauvignon and last but not least, Sémillon came off the vines just a few days ago. This in a challenging vintage in which veraison did not exactly come early. Despite the trepidation heard all summer long, I have to believe that the wines from 2013 will be some of the most interesting and alt-exceptional we have ever seen. A collector’s vintage. Something is just in the air. BC is already picking Icewine on Beaujolais Nouveau release day. Can Ontario be far behind? In British Columbia the Icewine harvest began on November 21st and picking is already complete. Nothing short of remarkable. Ontario will not be far behind. Let it hereby by known that @Stratuswines has officially picked Niagara's last grape of #harvest2013 as of Nov. 27. Just icewine to go! So how do we explain this supernatural convergence of grapes having achieved phenolic ripeness and winter coming so early to complete the annual growth cycle of grapevines? Like Thanksgiviukkah I suppose, this kind of cosmic confluence only happens once every 77798 years. For that I am thankful. And for my family, my beautiful wife, my three perfect children, four healthy parents, and for my friends, new and old. I am also amazed every day by the quality of food and wine we are growing in our backyards and just a hop, skip and a jump down the road. 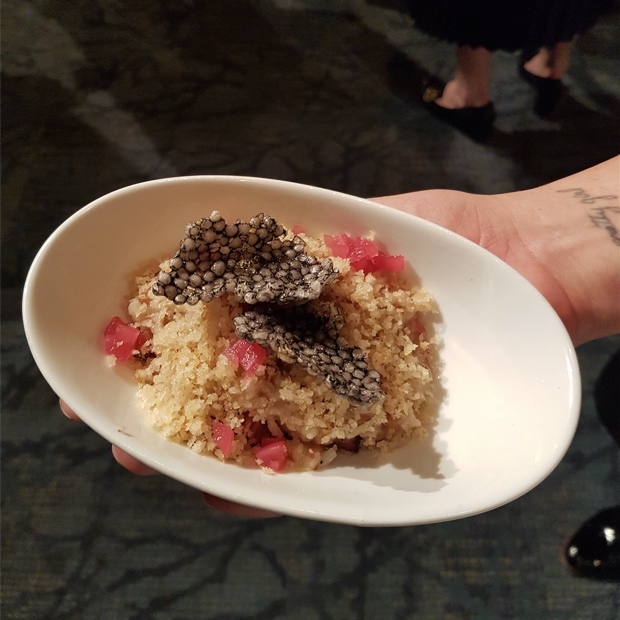 What a time it is to be a (cough) foodie or a wine geek in Ontario, in Canada and in the world. So, while the cosmos are in impossible exquisite chaos, I can think of no better time to put my wine recommendations on their head and offer up tasting notes on a winter six-pack of Canadian whites and bubbles.